Having finished my Labor Day Dinner of a roast salmon and cumin spiced roasted cauliflower I wanted something special for desert to end my Labor Day. Looking around my fridge I found 3 of my favorite foods. Fresh Figs, Tupelo Honey and goat cheese. 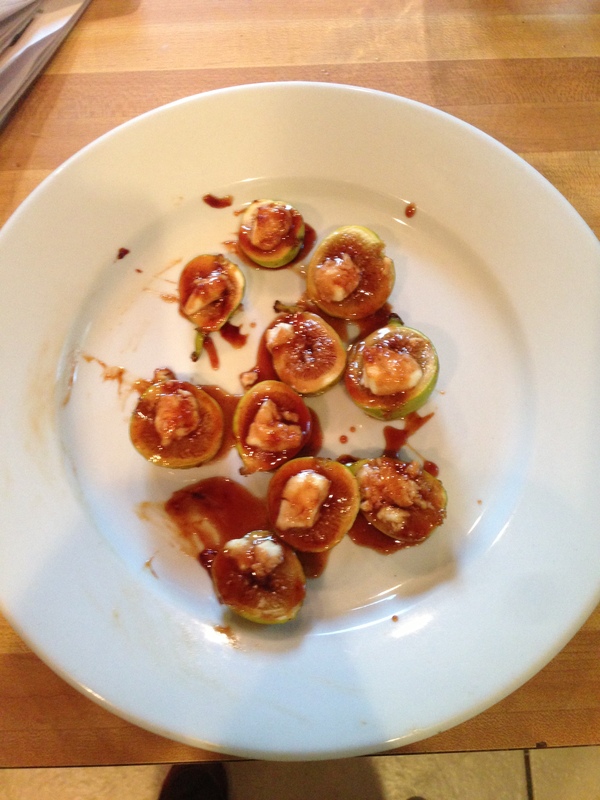 Since my oven was already warm I decided to have roasted figs with goat cheese on top with a balsamic/honey sauce. Amazing! Pretty simple recipe. Heat oven to 400°. While oven is warming up add 1 tbsp of butter, 3 tbsp of balsamic vinegar & 3 tbsp of honey with a touch of Maldon salt. Bring to a boil and simmer for 5 minutes. Slice 6 fresh figs (I used green California figs) vertically and place on a baking sheet skin side down. Add a dolop of goat cheese and then pour the sauce over the figs. Roast the figs in the oven for 15 minutes. Simply mouthwatering and wonderful way to end Labor Day!